After a brief, morbid fascination with Mount Everest, possibly initiated by this blog post (warning: the linked post features graphic photos of dead bodies), I’ve consumed just about every freely available article, documentary, and blog post about summiting the world’s tallest peak. 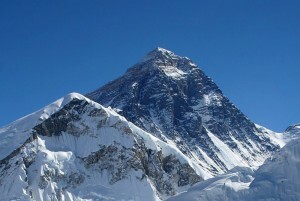 My primary impression: Everest is a place where people go to achieve their dream, or die trying. Everest’s fatality rate is around 6%, a figure that pales in comparison several other of the planet’s highest peaks. Still, Everest’s allure has beckoned thousands of climbers to test their resolve since Sir Edmund Hillary first summited in 1953. In the last 30 or so years, commercial expeditions have guided climbers–many of them relatively inexperienced–to the 29,035 foot summit for prices up to $65,000. A trip to the summit of Everest is one of the most grueling feats humanly possible. It requires several hours of creeping along sheer rock faces and precarious knife-edge ridges within the Death Zone, an altitude above which the human body is incapable of acclimatizing. In fact, in the Death Zone, all you’re doing is dying. No human can survive more than 48 hours or so at this altitude. On a good day, Oxygen concentration is one third of that at sea level. Climbers are faced with the realities of High Altitude Pulmonary Edema (HAPE), High Altitude Cerebral Edema (HACE), and frostbite due to temperatures as low as -70° Fahrenheit. Any of these can be deadly, and any of them can strike anyone at any time, regardless of experience or acclimatization. Then there’s the fact that mountaineers find themselves clutching tiny pathways miles above the surface. Think Rainbow Valley sounds like the kind of place where unicorns are born? No, it’s a feature of Everest so called because it’s littered with corpses of climbers who have fallen and lie there–unrecoverable–still wearing their multicolored down expedition suits. Everest is a graveyard. It’s littered not only with empty Oxygen bottles and wind-shredded tents, but also with the bodies of the hundreds of climbers who couldn’t make it down. In the inhospitable conditions at 28,000+ feet, rescue is nearly impossible. Climbers must at times literally step over the dead on their way to the summit. One dead climber, referred to as Green Boots because of his fluorescent green mountaineering boots , has been a fixture on the approach to the peak for over 14 years. Another, the body of expert guide Scott Fischer, lies near the summit. Fischer and Green Boots, whose name is Tsewang Paljor, both died in May of 1996, during the deadliest day ever on Mount Everest. There have been periods of increased scrutiny of the popularity and commercialization of Mount Everest, particularly surrounding the aforementioned 1996 disaster, and the highly publicized 2006 death of a British mountaineer named David Sharp. Scores of people safely trek to the top of the world each year after thousands of dollars and weeks of acclimatization are spent. Relatively few succumb to the elements in the otherworldly environment five and a half miles above sea level. All the same, I’m content reading and viewing accounts of the experience from the comfort of my Oxygen-rich living room.